Herald and Review Library: Photo of Macon County, IL. Draftees; Article on back of photo; "These men make up Draft Board No. 1's and the Macon county rural board's second February quota for the draft army. 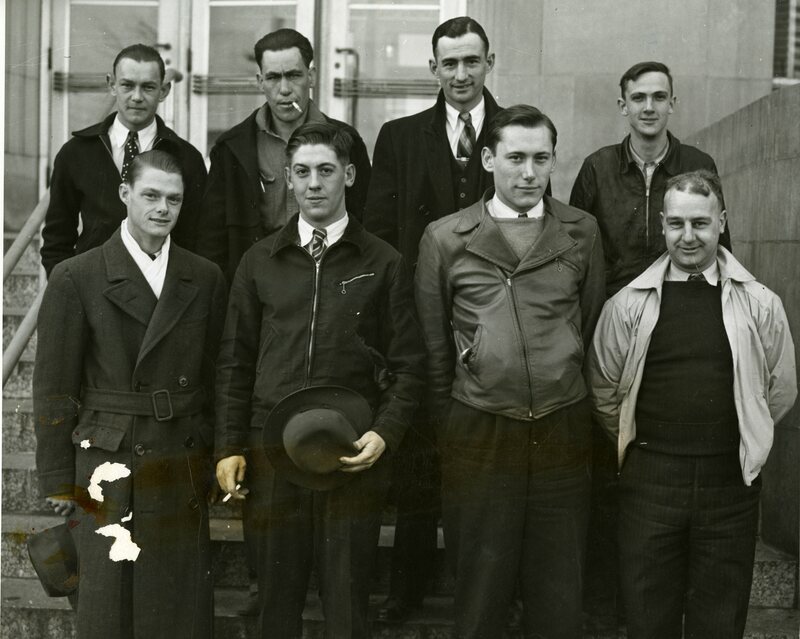 They are, left to right: First Row: Charles Neil Williby, Harristown; John Philip Martin, 725 North 34th; Leo Francis Thein, 968 W. Eldorado and J. Russell Walter, 1140 W. Cushing; Second Row: David L. Williams, Jr., Staunton; Jess Nash, 2360 W. Grand; Fred L. Coombe, Macon, and Obie Martin Lowe, 1422 N. Broadway. Charles M. Duncan, Board No. 1 selectee, was to meet the group at the Chicago induction station today." The Decatur Public Library owns and maintains all copyright on materials featured on omeka.decaturlibrary.org. These materials cannot be used without prior consent. Please contact the Local History Room at the Decatur Public Library for more information." Herald and Review, “Photo of Macon County, IL. 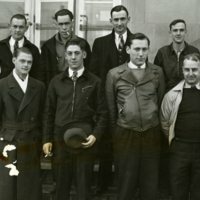 Draftees Standing on Courthouse Steps.,” Decatur Illinois Public Library Local History Photo Collection, accessed April 24, 2019, http://omeka.decaturlibrary.org/items/show/2028.